My kids ask for this quick and easy dish once a week. I think they just like saying the name. Heat the olive oil over medium-high heat in a large, deep saute pan. When the oil is hot, sauté the garlic, and cook for a minute. Lower heat and carefully (it will splatter if too hot) pour in the chopped tomatoes and cook it for 5 minutes, stirring occasionally. Add the olives and capers. Turn the heat down to a gentle simmer. 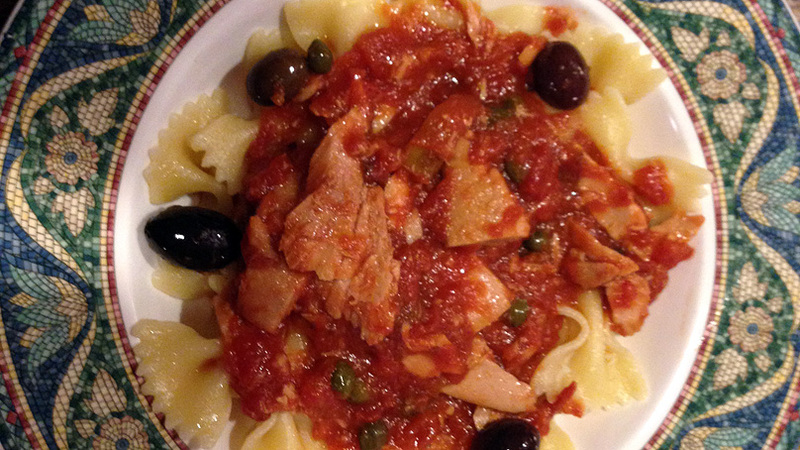 When you add the pasta to the boiling water to cook, add the tuna to the sauce and continue to simmer it gently. Cook the pasta according to the package instructions, to al dente. Drain the pasta and return it to pot. Stir the parsley into the pasta sauce. Combine the sauce and the pasta. Serve in pasta bowls and sprinkle with parmesan, black pepper, and crushed red pepper to taste.